A garden centre has been criticised for promoting soon-to-be-banned slug pellets. Everton Nurseries near Lymington, Hampshire displayed a sign urging customers to "please stock up" on metaldehyde pellets. Friends of the Earth said it was "irresponsible" to encourage use of the chemical which is to be banned over concerns about its effects on wildlife. The store later apologised, saying it was "completely wrong". Last year the government announced sales of Metaldehyde, a pesticide used to control slugs in a range of crops and in gardens, are to be banned in June. The Department of Environment, Food and Rural Affairs said it posed an "unacceptable risk to birds and mammals". 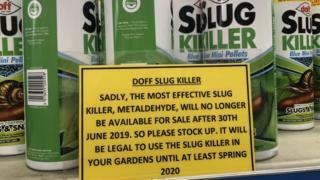 The garden centre placed a sign alongside its stock of metaldehyde slug pellets saying: "Sadly, the most effective slug killer, metaldehyde, will no longer be available for sale", before encouraging customers to stock up and use the product during the period of 12 months when its use remains legal. New Forest Friends of the Earth tweeted a picture of the sign which it described as "outrageous". It said the chemical was "responsible for deaths right up the food chain - hedgehogs and birds for example". The Flower Power Lymo community allotment group in Lymington tweeted: "Please help STOP this. Encouraging the use of metaldehyde slug pellets is wrong. They're banned for a reason." In a statement, Everton Nurseries director Simon Collyer said it was an "ill-advised attempt to promote sales" by a junior member of staff. "We agree that it was completely wrong to promote the sale of product shortly to be made illegal. "All units of the product and associated signage have been removed from the shelves and Everton Nurseries will no longer offer it for sale," he added.